Basic information about uranium and uranium's uses, abundance, history, compounds, interesting facts, and historical use. Uranium is a very important element. Its symbol is U. 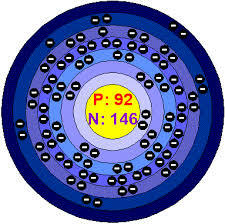 The atomic mass of uranium is 238.029 atomic mass units and its atomic number is 92. Uranium was officially discovered in 1789, in Berlin, Germany. However, before uranium was officially discovered by Martin Heinrich Klaproth, it and oxygen were used to make ceramic glaze that was colored yellow in ancient times. Martin discovered it when he was studying the mineral pitchblende. He put the pitchblende in nitric acid making the pitchblende dissolve. After that he added potash making the dissolved pitchblende yellow. Then when he added more potash it dissolved the yellow color. Martin knew that there were no other elements that had the same reaction, so Klaproth concluded he discovered a new element. He named the element uranium because the planet Uranus was recently discovered. Then in 1841 French chemist Eugene-Melchior Peligot isolated uranium metal by heating uranium tetrachloride with potassium. Uranium is very abundant on the Earth. It is about as common as zinc or tin. Uranium is especially abundant in the Earth’s core. In parts per million the Earth’s crust has 1.8ppm. of uranium in it. Also most rocks and seawater has uranium in it. The universe however has only a little uranium in it. It is 0.0000002% uranium. ﻿​Uranium is a highly reactive element. It reacts with almost all of the nonmetals and a lot of there compounds. Uranium dissolves in acids. Some of its common compounds that uranium has is uranium sulfate, uranium chloride, uranium boride, and uranium carbide. Also, uranium oxide is the chemical compound used for nuclear fuel. The most common uranium compounds are uranium hexafluoride and uranium tetrafluoride. When uranium isn’t a compound it is a silver metal. An interesting fact about Uranium is that it has been used since Ancient Rome and the Medieval Times to color glass and ceramic glazes. Glow-in-the-dark paints are also made by extracting radium from uranium. Another interesting fact about uranium is that one kilogram of uranium can produce as much energy as 1500 tons of coal. Also about 33% of uranium is mined in Kazakhstan which is a country in Central Asia. Uranium is historically referenced in World War II when America used their first atomic bomb. In the bomb they used to drop on Hiroshima in Japan in 1945, the core of the bomb was made of uranium. Today, uranium is used for fuel for nuclear power plants. The type of uranium used at those power plants is uranium-235. In the nuclear power plants the heat generated from the uranium creates steam that turns the turbines and makes electrical power.Uranium is also used for nuclear bombs today. The military also uses depleted uranium in bullets, missiles, and is put on tanks to protect it. The military uses uranium so much because a tennis ball made of uranium is about 5.7 pounds which means it is very durable. Depleted uranium is also used as ballast on ships which means it is used to help balance ships. The counterweights, which help balance aircrafts, also have depleted uranium in them. This a video of a model of a high energized neutron hitting with a nucleus of uranium-235. This shows how the high energized neutron sets off a chain reaction within a uranium-235 nucleus. This link gives good, helpful, basic information about uranium. This link is also helpful and goes more in depth than the other one. "Uranium Facts - Uses, Properties, Element U, Radioactive, Nuclear, Energy." Uranium Facts - Uses, Properties, Element U, Radioactive, Nuclear, Energy. Science Kids, n.d. Web. 29 Oct. 2015. Pappas, Stephanie. "Facts About Uranium." LiveScience. TechMedia Network, 09 July 2015. Web. 29 Oct. 2015. "Abundance in the Universe of the Elements." Abundance in the Universe for All the Elements in the Periodic Table. N.p., n.d. Web. 29 Oct. 2015. Zyga, Lisa. "Why Nuclear Power Will Never Supply the World's Energy Needs." Why Nuclear Power Will Never Supply the World's Energy Needs. N.p., 11 May 2011. Web. 29 Oct. 2015. "World Nuclear Association." Uranium Supplies: Supply of Uranium. N.p., n.d. Web. 29 Oct. 2015. "Uranium." Chemicool Periodic Table. Chemicool.com. 24 Jul. 2015. Web. 10/29/2015 <http://www.chemicool.com/elements/uranium.html>. "What Is Uranium?" What Is Uranium? QUART.US, n.d. Web. 29 Oct. 2015. K., Maggie, and Kirsten S. "#92 - Uranium - U." #92 - Uranium - U. N.p., n.d. Web. 29 Oct. 2015.